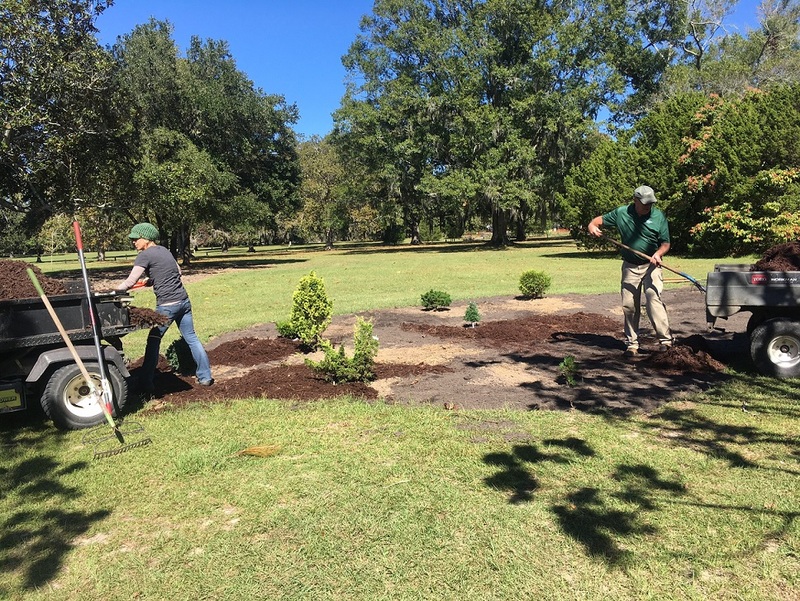 Since 2016, Brookgreen Gardens has been a member of the American Conifer Society’s Reference Garden Program. 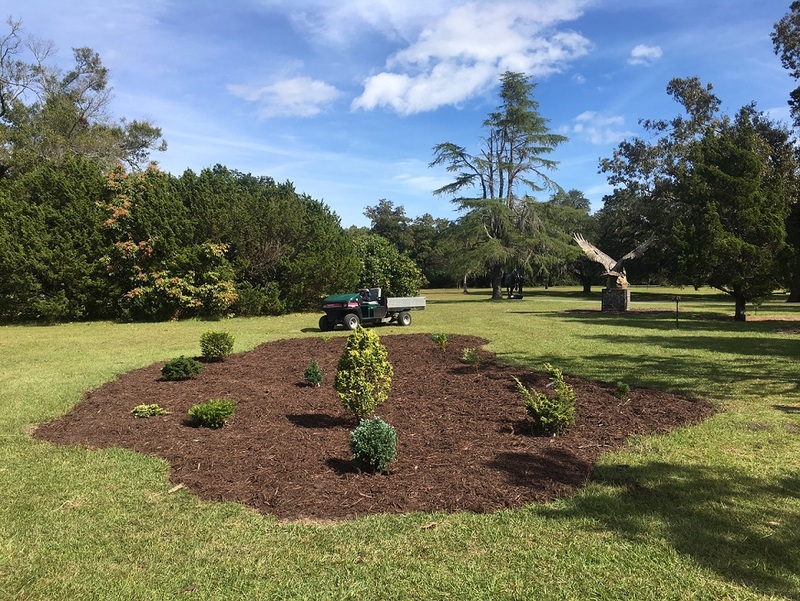 Although people are often surprised to learn that conifers, or cone-bearing woody plants, can grow well in our area, what may be even more surprising is that the Southeast Region of the American Conifer Society (ACS) boasts the most Reference Gardens of any other region. 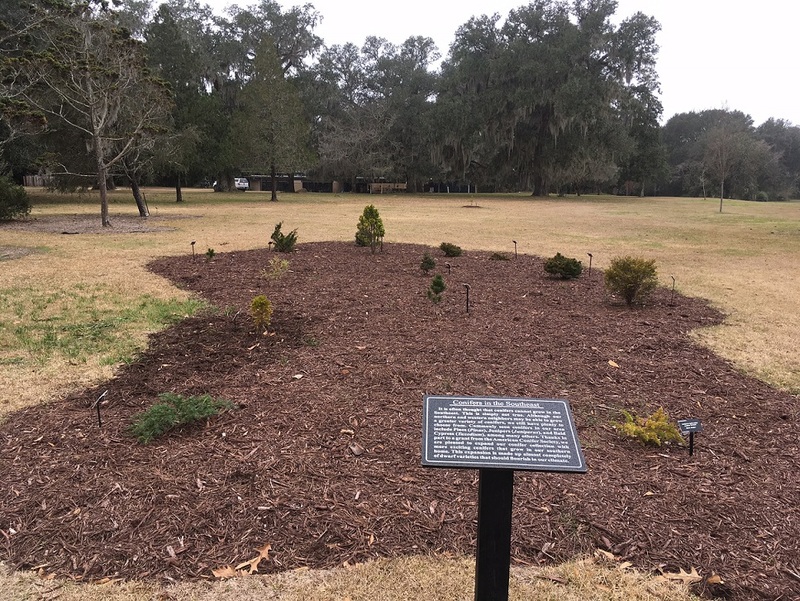 As a Reference Garden, we are acknowledged for maintaining our conifers, displaying signage identifying the plants, and providing ACS information on site. To ensure our continued success, two ACS sponsors visit our gardens at least once a year to make sure we remain in good standing. One of the perks of being a Reference Garden is being eligible to apply for a grant from ACS. 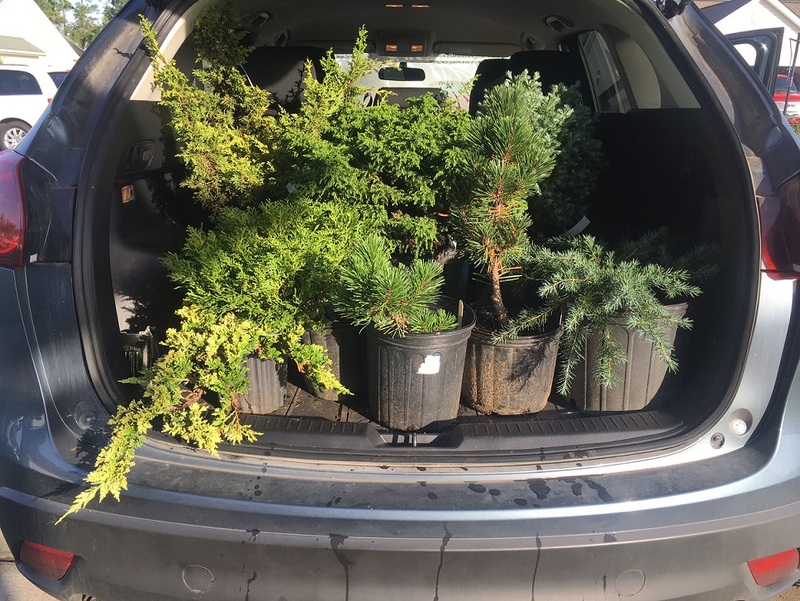 Last year, we applied and were awarded a grant to expand our conifer collection. With an emphasis on dwarf varieties, we sought out cultivars that would perform well in our climate. Naturally, we turned to Landscaping with Conifers and Ginkgo for the Southeast by Tom Cox and John M. Ruter, a great resource especially for our area, which offers guidance on conifers that grow well here. This helped to tailor our plant selection with specimens that would enjoy our climate. 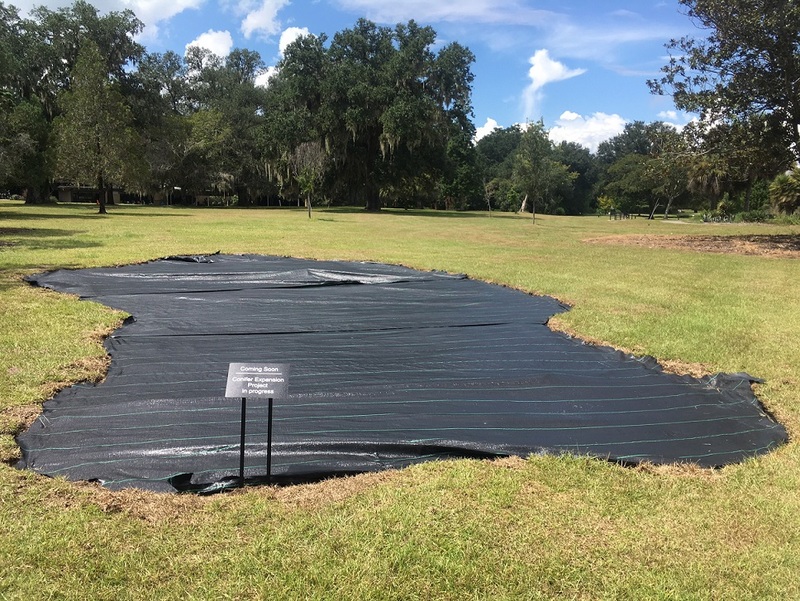 In the late summer, before we could begin planting, the expansion site was prepared. 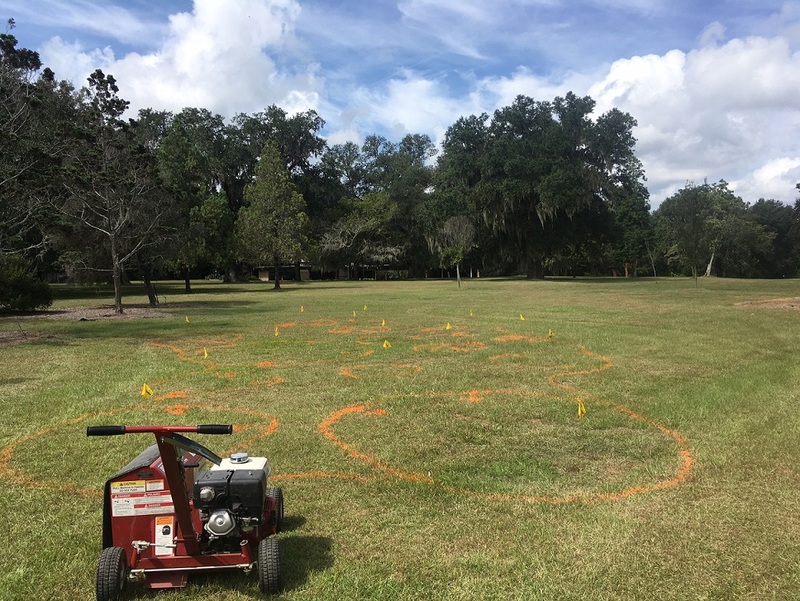 With marking paint and irrigation flags, we indicated where each conifer would go and drew a circle around them to indicate their mature spread. Following that, we drew a bed line to outline our new planting area. Next, it was time to bed edge and create a crisp border. Carefully, we traced our painted line with the bed edger. Although we had a bed established, we still had turf in the way. 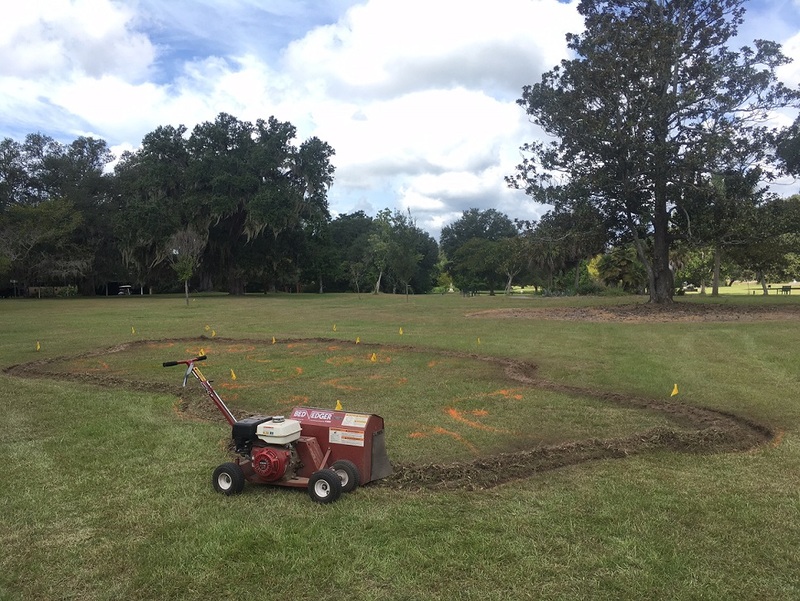 We rented a sod cutter and got to it. 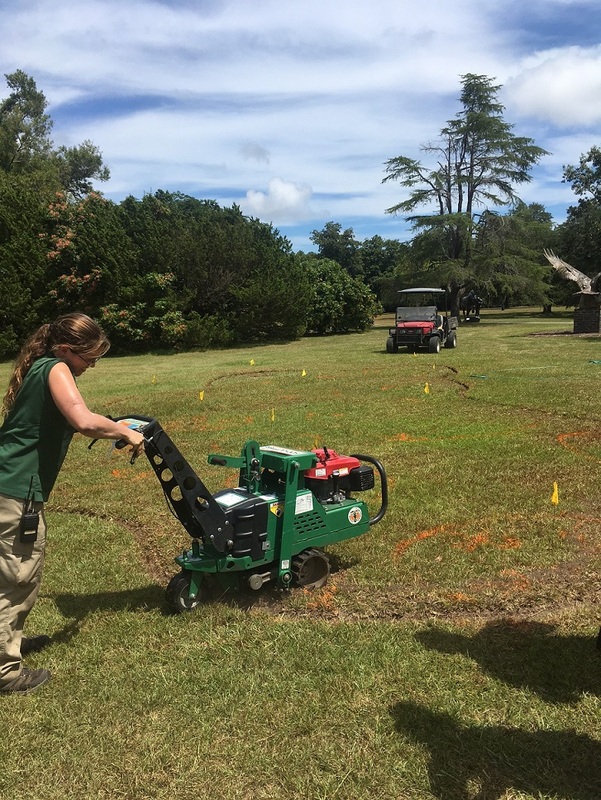 Gina, one of our Horticulturists, manned the sod cutter and made fast work of severing the roots from the soil. The rest of us worked to remove the freshly cut pieces. Having perfectly good turf at our disposal, some of the pieces were taken to other areas in the gardens in need of a little sprucing up (conifer pun intended). Once our first phase was complete, we brought out landscape fabric, a material often used to suppress weeds, to cover the space. Our goal was to keep the area free of weeds between the time we prepared the bed and the time we planted. Something important needed to happen before we could go any further with our project. Picking up the plants! One of the closest nurseries we could find with the plants we were looking for was located outside Asheville, North Carolina. A trip to Mountain Meadows Nursery was in order. Michael Balogh, owner of the nursery, was a gracious host, showing us around his nursery (and making me jealous of the even greater breadth of conifers they can grow in their cooler climate) and sharing his palatable love of plants. Excited to get started with the next step, we returned to Brookgreen. Once the cooler weather started rolling in, it was time to plant our new conifers. We removed the landscape fabric and began to prepare our site further. Compost was added as a top dressing which would also be incorporated into the soil at the time of planting. After the compost was spread, the plants were then brought out to the site and were laid out for planting. 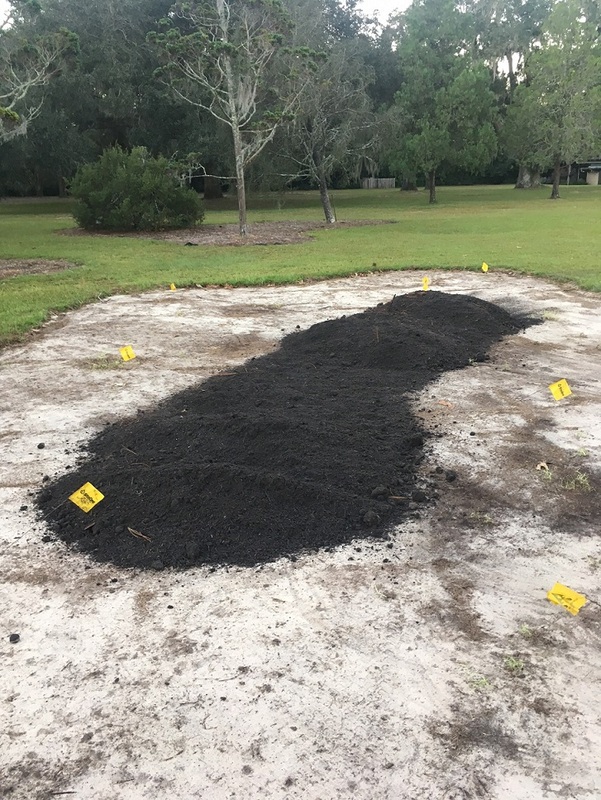 Although the bed may seem large for the plants, we planned our planting for the future, with our sights towards the plants as fully grown specimens. Following planting, mulch was applied to the site. Mulch serves so many purposes beyond simply dressing up a bed. It helps retain moisture in the soil, suppresses weeds, assists in regulating the soil temperature, and, as it breaks down, it also richens the soil, which will feed the plants. With the plants now in the ground, we needed to add our conifers to our Plant Database. After the information was entered in, display labels were created for the plants indicating the botanical name, common name, family and place of origin of the plants. So, what have we planted? Included in our addition is Pinus thunbergii ‘Kotobuki’ (Japanese Black Pine), Cedrus deodara ‘Feelin’ Blue’ (Himalayan Cedar), and Juniperus x media ‘Plumosa Aurea’ (Chinese Juniper), to name a few. We have also included outside of the (mostly) dwarf bed Pinus glabra (Spruce Pine), which is a fast growing conifer. 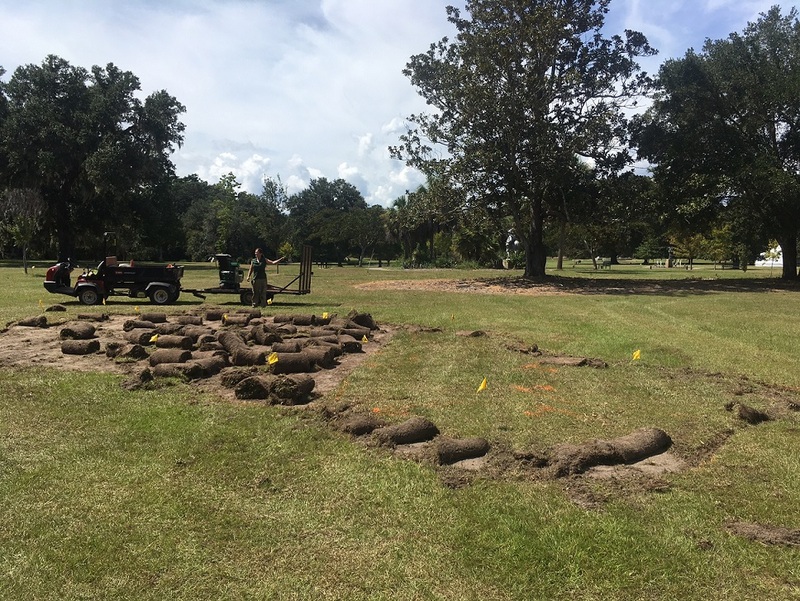 Over your trips to Brookgreen Gardens, please stop by our new conifer expansion site. Although our dwarf collection is very slow growing, it will be exciting to watch as our new additions grow into their spaces. For now, enjoy our new expansion near Sandy Scott’s Presidential Eagle.